In the world of Mysthea, it’s really important to acquire the right tools to secure dominion of lands and empower your clan. 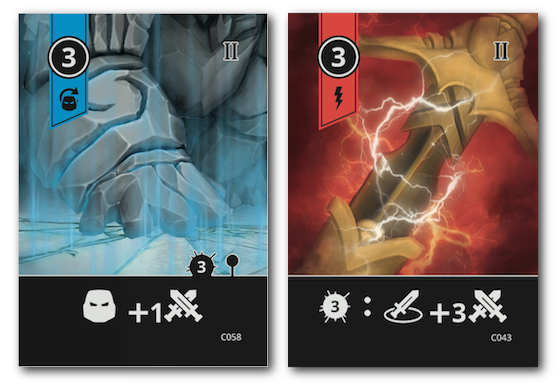 Cards in Mysthea have a key role: during your turn you can play one to get some command points, which you will need to deploy and move your troops to increase your strength over the lands of Icaion. Additionally you can spend Energy points to gain a powerful effect depending on the type of the card: red cards have a one shot instant effect, blue cards buff your troops and action for the entire game, yellow cards give you side quests and additional scorings, and green cards represent special skills that your Champion can use multiple times during the game. When a fight is triggered, unplayed cards can be used in combat to give orders to the troops involved, possibly giving you the upper hand. The color indicates whether you want your troops to fight, to defend, to retreat or to negotiate. The command point value indicates the intensity of your choice. Players start the game with a small set of cards, but you can always acquire new cards from a common display as an Action during your turn, increasing your possibilities and strategies. Each card is unique and different from all the others, and it's up to you to decide how to use each card: to gain powerful effects, in combat to surprise your opponents or to get some command points to strengthen your army. Every card is a great addition to your hand and can be used multiple times. The hand management mechanism is one of the core aspects of the game: before starting a new Era, every player collects back into their hand all the cards previously played in their own discard pile. This means you get to use them again in the new Era. Deciding when and how to use a card is a huge part of Mysthea. Thanks to the hand management, every card can be used multiple times in different ways. This creates a deep and tense tactic and strategic planning, always very different and highly customizable to your favorite play-style. Next week, we'll be diving into the Combat mechanic, and taking a closer look at how Monsters like Boulron or Caerulas could wreak havoc for our Champions, and force rivals to work together if they want to survive the harsh islands! Follow us on Facebook and Instagram to see sneak peeks of the artwork, characters and miniatures of Mysthea!